I feel like I should be more surprised or hyped that Sunrise is teasing a “continuation” of Iron-Blooded Orphans one of my favorite Gundam series in recent memory. However, hype eludes me at the moment as Sunrise has not exactly been coy about bringing the series back to television screens. With new Iron-Blooded Orphans GunPla launching shortly it makes sense Sunrise would air a advertisement new series to compliment them. Though I got to ask, how would they even do this? Iron-Blooded Orphans finale was rather final after all. Massive Spoilers for Gundam: Iron-Blooded Orphans, like seriously do not read anymore if you have any wish to remain unspoiled. So as we are all aware the majority of the titular Orphans were left buried or scattered to the wind by the events of Season Two. This includes the core cast of characters such as Mikazuki Augus and Orga Itsuka. Two of the most compelling and popular characters to come out of a Gundam franchise in years. Their endings in many ways limits the ability for a new Iron-Blooded Orphans season to be set in the current time frame. As quite frankly the series would be rather hollow without them. While there are stories to tell post Season Two, they seem much more personal in nature, rather the grand conflicts that define Gundam. More fitting of an OVA series that would be unlike Gundam OVA’s of the past, even compared to the more personal stories such as War in the Pocket. Some interesting stories do exist, such as Ride’s potential life of vengeance as hinted in the epilogue. By and large thought I like the future of Iron-Blooded Orphans to remain clouded. As what makes Iron-Blooded Orphans unique and quite divisive among fans is that the ending while bloody was fundamentally a good one. Normally in Gundam when the body count is high the ending is more melancholy such as in Victory Gundam. In Iron-Blooded Orphans on the other hand the antagonists did succeed in achieving their goals, the goals as it turned out actually aligned with that of the protagonists. Mars was freed, Gjallahorm was reformed, and liberty and prosperity seemed much more achievable - even for former space debris. A series following this directly would just be difficult, likely resulting in a Gundam SEED situation where a continuation feels tacked on and inorganic. The stories of the Iron-Blooded Orphans are complete and final, with a continuation being a disservice to its ending. That does not mean there is no stories to tell in this world, it just would not be the Orphans story. This leaves two alternatives for the producers; one I think is eminently more optimal then the other. The first is an alternate continuity whereby choices and decisions made in the second season just do not happen - Sunrise is going down this route with Code Geass with alterations in the theatrical releases. The difference is that Code Geass is over a decade old, while Iron-Blooded Orphans is still rather fresh - being the last mainline Gundam anime released. As such I doubt Sunrise will choose this path. The other path is one I am personally cheering for and I believe other fans are as well: a prequel. Despite only having 50 episodes Iron-Blooded Orphans was quite adept in crafting what felt like a living and lived in world. Complete with a deep and interesting history only hinted upon in the canon material. I am of course talking about the period known as the Calamity War. A time when humanity was brought to the brink of extinction by AI powered killing machines the Mobile Armors. Which were named for Angels in comparison to the demonicly named Gundams. During this time the 72 Gundam frames are first built and manage to save humanity from certain annihilation. 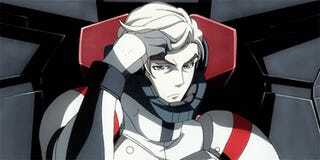 Those who fought using the Gundams would then go on to found Gjallahorn as led by the pilot of the Gundam Bael. By the time of Iron-Blooded Orphans this war is a legend, one so powerful it inspires McGillis’ revolt against Gjallahorn itself. 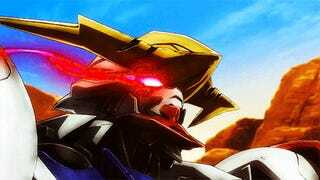 A series set during this time would expand upon the lore while being a Gundam series unlike any other. Although AI have played a role in Gundam previously it was nothing like the monstrosities that were the Mobile Armors as depicted in the second season. The scale and tone of the series would be radically different from the first series and I love that. Furthermore, we would finally see what the hell caused that damn crater in Australia that was teased all the way back at the beginning of the first season. Honestly, not knowing what that is still drives me a little batty. Personally, I actually think Sunrise is likely to go down this route and has given a few hints as to its plans. The first is the teaser image above. While it looks very similar to Barbatos in frame and armament there is one key design change - the third middle “horn” on the head of the Gundam. While Barbatos always had two horms the third horn is unique to this image. 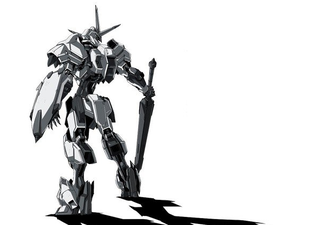 Beyond this the image seems to be of a Barbatos, not Barbatos Lupus Rex the suit that was piloted at the end of Iron-Blooded Orphans. 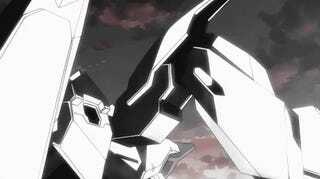 If the series was a continuation and the Barbatos was being piloted by someone new, would it not be the more advanced model? Could the image be a more complete Barbatos, one where the “horn” is broken during the events of the war? Could I be focusing way too much on a single element of an image? Either one is possible at this point, but speculation is fun regardless, plus this article is literally called Down the Rabbit Hole. You had to expect some wild speculation. The second piece of information is like most Gundam from their GunPla plans. It is said Bandai will be releasing new models from the Iron-Blooded Orphans anime including new Barbatos and Gusion models. As such it is highly likely these suits would appear in the upcoming anime. Except at the end of Iron-Blooded Orphans those suits were pretty conclusively destroyed End of Evangelion style. While they could be rebuilt the suits do exist in the prequel time frame, from where they originate. At the end I am firmly a supporter of leaving Iron-Blooded Orphans ending as is, while exploring the interesting history of its world. It would be a fresh take on Gundam while keeping it grounded in a world fans seemed to have responded well too. Also I want to know what happened to Australia damn it! What do you guys think? Would you like a prequel, a sequel, or a spin-off? Let us know in the comments.